This is the fourth release by the BBC Philharmonic under its Chief Conductor, Juanjo Mena, and the discography is going from strength to strength – their recording of orchestral works by Falla was ‘Recording on the Month’ in BBC Music. They are joined on this recording by the bassoonist Karen Geoghegan. Weber wrote the waltz Aufforderung zum Tanze (Invitation to the Dance) in 1819, around the time when he was also working on the opera Der Freischütz. The two works crossed paths once more, in 1841, when the latter was performed at the Opéra de Paris. Berlioz had been commissioned to orchestrate Aufforderung zum Tanze so that it could be incorporated into the opera, and he did so by melding Weber’s polished and elegant original with his own sound world, with customary panache. It is the version included on this disc. Also featured are Weber’s Symphonies Nos. 1 and 2. That these works should be so neglected is partly down to historical accident; they were composed just four years after Beethoven’s monumental ‘Eroica’ Symphony, the work which ditched the rulebook once and for all, and which turned the genre from classical perfection into a personal musical manifesto. So when Weber’s symphonies saw the light of day, overshadowed by the great master, no one took much notice. However, these works are brimming with melody and invention and are unfailingly entertaining. Also on this disc is the composer’s Bassoon Concerto. Much of the work’s appeal derives from Weber’s ear for sonority, and in particular the dark-hued palette natural to the bassoon. The finale has the bassoon playing a jester of great agility, yet with enough elegant touches to dispel any clichéd ideas of the instrument as a figure of fun. The movement builds to an assured and almost reckless virtuoso ending. Karen Geoghegan is the soloist in this work. Gramophone said of this young artist that ‘lyrical, mellifluous playing seems to come as naturally as wit and charm’. 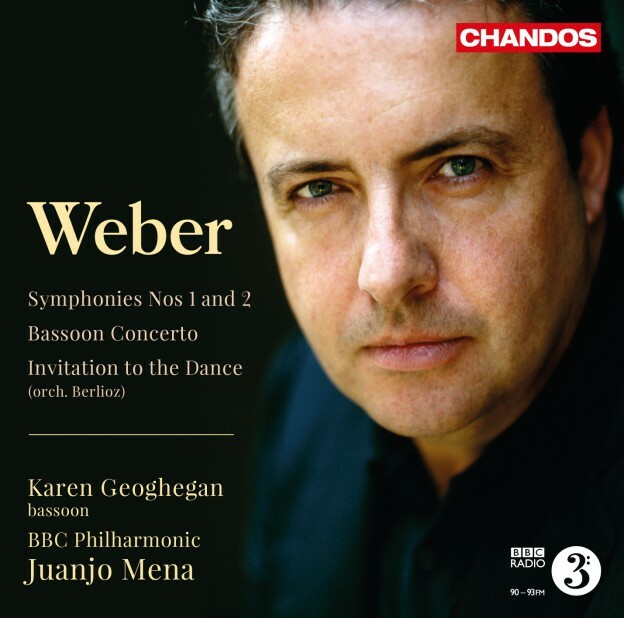 "…They [the symphonies] make genial listening and the BBC philharmonic under Juanjo Mena provide an interesting programme, beginning with invitation to the dance orchestrated by Berlioz, and between the symphonies Karen Geoghegan plays the bassoon concerto, Chandos do well to give us this near forgotten repertoire." "… superbly prepared, played and recorded … A winner."